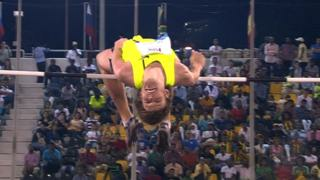 Russia's Olympic champion Ivan Ukhov wins the high jump in Doha clearing 2.41m, the best jump in the world so far this year. It was also the third best jump of all time and just 4cm behind Javier Sotomayor's world record. Home favourite and Asian record-holder Mutaz Essa Barshim could only manage fourth while Olympic bronze medallist Derek Drouin came second.